Meghan in Jimmy Choo heels, making it look so easy! PA photo. 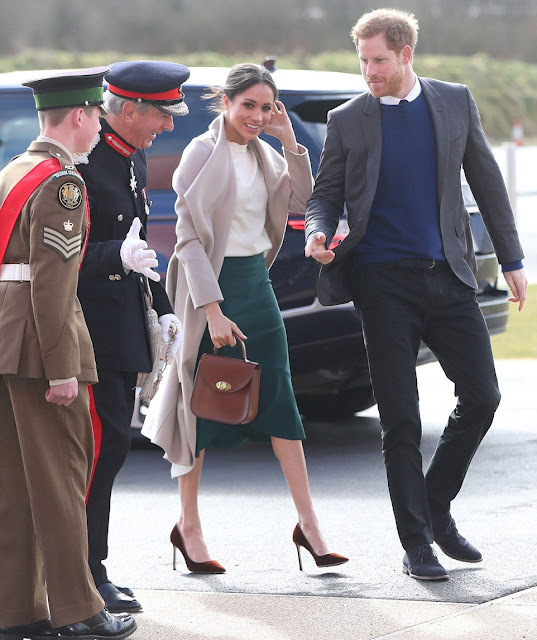 Since my recent post on First Lady Melania Trump in an ice blue coat and sky-high heels, I am thinking about high heels even more, so I couldn’t help loving these photos of Meghan on a recent trip with Harry to Northern Ireland. I liked her whole look, and of course took note of her Jimmy Choo “Romy 100” heels (translation—4 inches). Meghan makes it look easy to walk around in them! A commenter over at Mad About Meghan noted she was having a hard time walking in new heels she had just bought and I chimed in saying I could relate and asking how ladies were walking in these things. Another commenter wrote in saying that the key to walking in high heels was a strong calf muscle to keep the ankle in place. Hmm, I will keep that in mind. I have to imagine a lot of it also comes from practice practice practice, like anything that requires some skill. It probably also helps if you don’t have to walk much! These Jimmy Choos are 4-inches high! AFP/Getty Images photo. 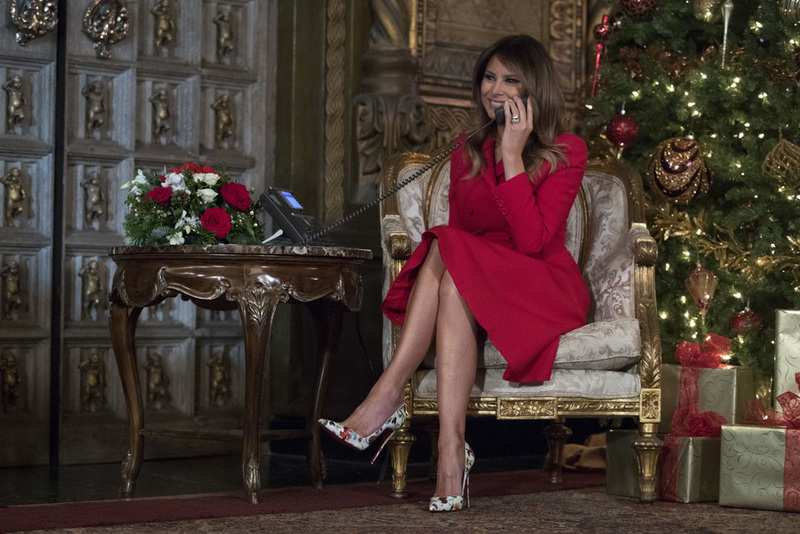 Loved these floral pumps with a red suit at Mar-a-Lago at Christmas. With Meghan about to become a British citizen, the High Heel Wearer-in-Chief in this country has to be the current lady resident of 1600 Pennsylvania Avenue. I don’t know how many high heel walking hours Meghan has put in—I have a feeling her numbers are going to jump exponentially in the next few months alone—but ol’ Mel has been wearing super high heels for years before becoming First Lady! I loved the floral Louboutins she wore several times in 2017. And I could sit around chatting on the phone while in 5-inch heels with the best of them, just like Melania at Mar-a-Lago over Christmas. Of course Mel can walk in these crazy high heels, which is the most impressive. She always seems to do it with complete confidence. During a state visit to China. Gorgeous! I was crazy for her pale pink “So Kate” pumps by Christian Louboutin that she’s worn multiple times in the past year. I also loved two outfits in particular she wore with them—the Gucci Chinese-inspired dress with pale pink fur cuffs, which she wore in China and which will go down as one of her finest fashion moments. The other look she wore the pumps with was a Dolce & Gabbana dress with an jewel-embellished shrug over it. Perfection! It never hurts to have a man in uniform to hold onto while you walk in your Louboutins! Let me know what you think of any of these looks or just the shoes themselves. If you have tips for high heel wearing, school is in session, please share them with us all! I've been sort of obsessing over heels a bit myself lately! 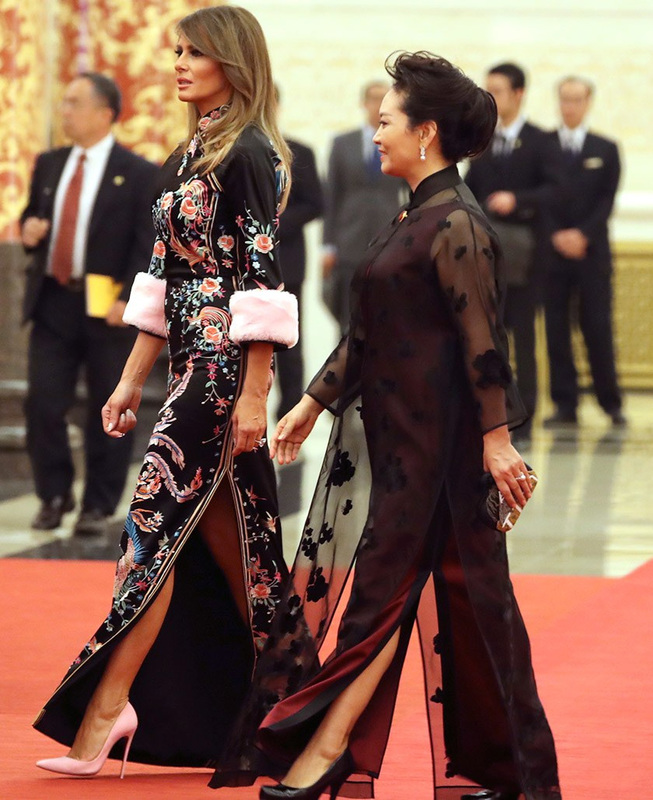 The outfit Melania wore in China (above pic) was best I've ever seen. I loathe high heels. I never could wear them and I refuse to be a fashion victim. I have a hammertoe on one foot so it's flats for me and I don't mind a bit. When I could wear heels, I was so uncomfortable. No way.